"The intoxicating game of skill and chance! Cheers! It’s always happy hour when you play this outrageous party game! Take a chance and roll the dice–this may become your latest vice!" 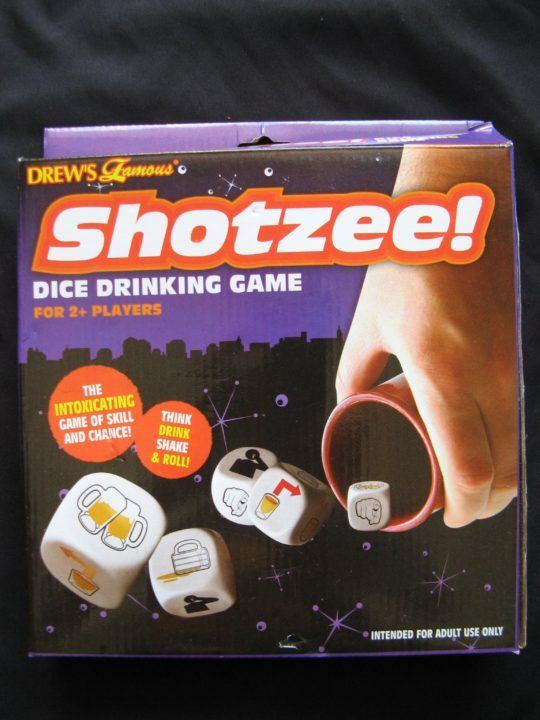 Shotzee is a Yahtzee-like game (hence the name) that incorporates drinking but can also be played without it. In the game, players roll dice to try to assemble either a full house, strait or a Shotzee (five of a kind). On his or her turn, a player rolls five dice. Each die will show one of six symbols, which may instruct the player or another player to drink, or may display a "party foul" for which no one drinks. The player will then look as his or her dice and decide which ones he or she wants to save (in order to try to get one of the winning combinations) and then marks those saved dice on a score card. Players then refill their glasses and play passes to the next player. When the original player plays again, he or she rolls however many dice were not "saved" on the first turn, trying to complete the chosen combination. Play continues until one player completes a winning combination of dice. The game comes with six tiny plastic shot glasses.